Despite the end of Colombia’s 50-year long conflict with the Revolutionary Armed Forces of Colombia – People’s Army (FARC-EP) in November 2016, the country still faces many challenges. Other armed groups and criminal organizations are still active. In some urban settings, poverty and the absence of the state create a breeding ground for violence that has serious consequences for people’s lives and health. 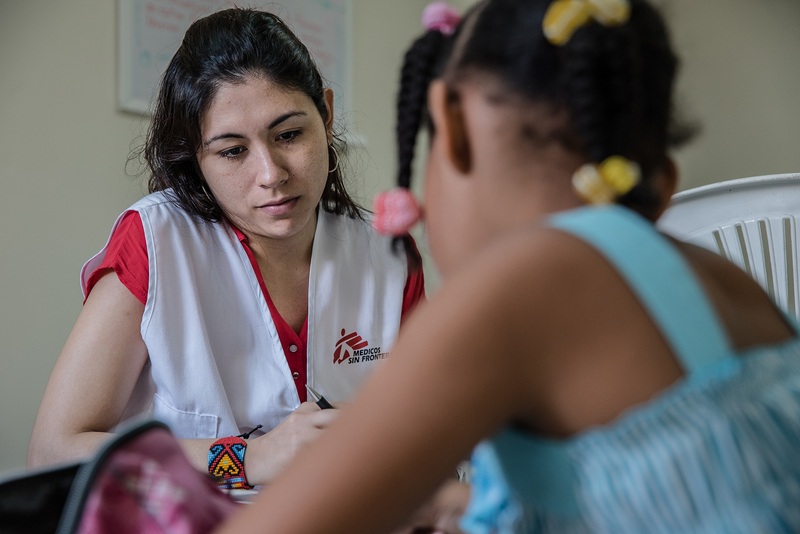 Médecins Sans Frontières (MSF) has provided physical and mental healthcare to victims of violence in the port cities of Buenaventura and San Andrés de Tumaco since 2014. MSF psychologist Brillith Martínez, describes working in Buenaventura, which has become one of the main corridors for drug trafficking to Central America and the United States. Sixty-five percent of the city’s residents live in extreme poverty and do not have access to basic services. Violence is contagious. I remember a woman who came to our office in Buenaventura with her three sons. The youngest had missed school for three years running. The only thing the oldest one wanted was to get a gun and join one of the armed groups. The middle child was always stealing things. He entered houses to take whatever he found or came home with things belonging to other children in the neighbourhood. And the mother, obviously, was depressed. As her story unfolded, we discovered that the family had been displaced three years ago – those same years the youngest one had missed school. And they had been living next to a casa de pique, a place where people who disappear are taken to be killed and dismembered. These children had lived there, next to that house, in a neighbourhood where murders are routine, and where, nearly every time they left their house, they’d come across a dead body. I first started working in Buenaventura a year and a half ago as a psychologist with MSF to tackle the consequences of what we call Other Situations of Violence (OSV). The displacement, disappearances, murders, sexual abuse and urban violence caused by criminal organisations are part of a legacy of conflict in this city. This woman never imagined that she or her sons would receive psychological treatment. She only came to our clinic when she didn’t know what to do anymore. She thought that by leaving the violence in the past, everything else would go away. Here, violence is so normalised that many people are convinced that’s just what life handed them, that it was just how they had to live. They were resigned to the violence. Especially the women, they are the ones most affected by it. Nearly all patients who arrive at the clinic have been sexually abused. And frequently, the abuse has happened repeatedly since childhood, when the abuser was a family member or someone they knew, and continued during the teenage years when girls begin to go out alone. And there are the mothers. Mothers who have lost their children to murder or disappearances. Mothers whose whole families have been killed, mothers who are displaced and penniless, single mothers and mothers who have been brutally abused. Violence isn’t only something out there; it also exists within the home, within the family. For the vast majority here, daily survival is already a feat. Many don’t know if they will eat today. In these circumstances, psychological treatment and mental health are the least of their worries. Another problem we have is the lack of medical infrastructure and healthcare personnel. For instance, there is not even a single psychiatrist in Buenaventura. If someone needs psychiatric care, they have to go to Cali, two-and-a-half hours away by road. Most people who live here can’t afford the trip. So, in the end, most victims don’t receive comprehensive treatment. MSF offers a free telephone-based care programme, which is the way most of our patients have reached us. Some of them come to us through our in-person programmes, but we deal with many more over the phone. This way, we ensure that women who don’t want anyone to see them entering the clinic—and therefore know that they have been victims—can also receive care. We also save lives over the phone. There are people who have suffered so much that now they only think about hurting themselves. So many people tell us, “I came here because I didn’t know what else to do, because if not, I’d just kill myself.” When you get someone in that state to climb out of that pit, it’s highly likely that person will help someone else, and then that person will help another, and so on. When MSF helps a single individual, we are also indirectly helping an entire family, a neighbourhood, a whole community.